He held a small rucksack. In it, a pair of shorts, a shirt, two pairs of pants, a pair of flip-flops and a beach read. 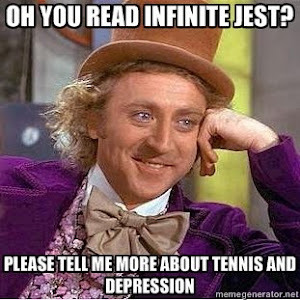 The book was by David Foster Wallace. Richard had put his favourite ‘Gone Readin’’ sign in the window of the shop and he hoped that this would be the case: he’d started the bloody thing half a dozen times and had yet to get beyond the first ten pages. Well, I got beyond 10.